A dental assistant is meant to assist an oral specialist, also known as a dental operator or dentist. The assistant will help give patients an efficient dental treatment. This is done in many ways. For example, the assistant could merely be in charge of preparing the patient for the procedure. The patient may need to be briefed on the procedure or on specific instructions that will make the entire process run smoothly. An assistant may also help sterilize the instruments that are going to be used during the treatment. The aid might pass instruments to the dentist while performing the treatment. Assistants have also been in charge of holding the suction device that is often used in dental procedures while others may retrieve dental radiographs when needed. Those who gain enough experience in the field may start to take dental impressions that will be used later on or may even start fabricating provisional crowns. In short, the dental assistant is there to help the oral specialist focus on the procedure and not be bothered with the little things. This makes the entire procedure a lot more efficient. The ideal assistant is effective and takes dental hygiene seriously. The high level of expertise and training that a dental assistant has is just part of what makes him or her an invaluable staff member. In the United States, some dental assistants can work without having a college degree, but other states require specific education or licensing. It is important to know what your state requires before initiating a career in this field. Now, what is required from all dental assistance is a certification that allows the assistant to take a position in the field. The certification usually focuses on infection control since sterilization will likely be one of the major duties of a dental assistant. This will not only protect the assistant, but it will also protect patients and the entire staff in the dental office. The Commission on Dental Accreditation of the American Dental Association is the organization responsible for licensing the dental assistant school where dental assistants train. Assistants that want to earn their certification and be recognized as a Certified Dental Assistant have to take the Dental Assisting National Board examination, which is sometimes called the CDA test. The test is only given to those who have completed the dental assisting program or those who have been in the field for two years or more. Some dental assistants are given expanded duties, which are usually covered in the dental assisting programs. These tasks could include restoration treatments after the dentist has removed oral decay. Some assistants are required to be proficient in administrative work while others are required to have clinical expertise. An assistant may be expected to prep patients, do some charting, help blend dental materials, or even provide post-operative requirements to the patient. Some assistants are also given inventory duties to ensure supplies are always in stock. 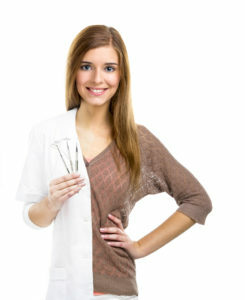 Most dental offices also require that all dental assistants are current with their vaccinations. This includes vaccinations for Hepatitis B, Tetanus, Measles, and even Polio along with any other necessary vaccine. The reason this is important is for the assistance’s own protection since he or she will be treating several patients a day, including children. The US Bureau of Labor Statistics lists all assistants under the healthcare support category. This means that those who enter this career are not going to earn as much as dentists. Still, this does not mean their earnings are not respectable. The median salary is $33,470 per year though that was back in 2010. The numbers might have changed since then, but it does mean that most dental assistant school graduates earn a little more than $16.00 an hour. It should be noted that some states, especially the ones in need of more assistance, end up paying more for their services. For example, Alaska has had a shortage of dental assistants, making it one of the best states for assistants who want to earn more. This is nothing more than a quick overview of the career. There is much more to learn that can only be learned through hands-on experience.